When I started crocheting again in my mid-30’s, I was a one project at a time gal. I would purchase my yarn at a big box store (this was before I knew of the allure of the LYS) with a project in mind, go home and crochet away, then think of a new project to make and repeat. For several years, that system of crochet worked for me. In 2009, my mom and I started planning a trip we would take together in early 2010. It was going to be my first cruise and I was so excited! I knew there were going to be a couple formal dinner nights on the trip, so I decided to make myself a shawl that I would wear. I combed through my issues of crochet magazines, and finally decided on the Moss Fern Wrap, designed by Kimberly K. McAlindin. My pattern was set! Now it was time to find the perfect yarn. I searched online, and was pleased to find a yarn store one town over; practically up the street from where I was currently living. I arrived at the yarn store, crochet magazine in hand, determined to find a great lace weight yarn for my shawl-to-be. The woman working behind the register welcomed me and asked if I needed any help finding yarn. I said it was my first time in the store, and could she show me where the lace-weight yarns were. She took me to a section of the wall filled with glorious color, and then she left me alone to touch the yarn and look at the colors for myself. Nearly five years later, I still appreciate that. She didn’t hover, or give me information about needle sizes that wasn’t useful because I crocheted. She gave me the freedom to explore on my own, and that was a huge confidence builder. I got to make the decision on what yarn to use, and that’s the point where everything changed and I started controlling where I was going to take my crochet. 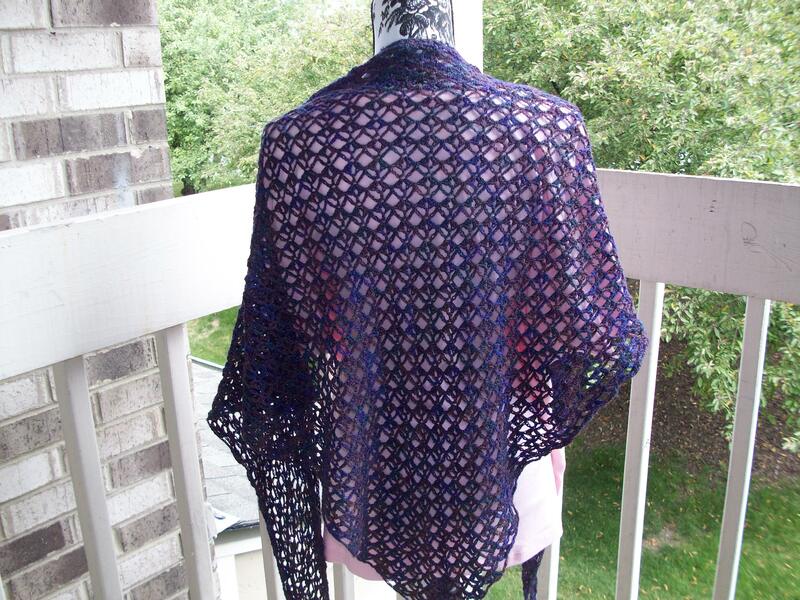 I chose a beautiful lace weight yarn by Mountain Colors, a purple with tones of deep blue and warm brown, and once I got home with my yarn I started stitching immediately. This is the final result. Here is a close up of the stitches, so you can see how the colors blend. So you may be thinking to yourself, “Laura, what does all this have to do with the question you posed in the title of the post?” I’ll tell you – it’s context. See, up until that point, I did what the pattern told me to do, including yarn choice. However, when it came to this shawl, I couldn’t easily purchase the yarn called for in the shawl, so I went out to find my own. That small step was a mini-designer moment. I adapted part of the pattern – yarn choice – to suit my needs. That small step led immediately to another one. At the register was a basket with some of the most beautiful yarn I had ever seen – Tilli Tomas Rock Star. 100% pure silk, with beads, and at that moment it was the most decadent yarn I had ever touched. It was also, at that time, the most expensive yarn I had ever touched. That soft sheen of the silk, the glint of light off the beads; I was hooked and had to have it, and thus my first impulsive yarn purchase was born. This beaded beauty wasn’t bought because I knew right away what I was going to make with it. I simply wanted that yarn on its own merits, and I figured I would find something to make with it later on. That first impulse buy led to others. I was no longer letting patterns dictate my purchases. Rather, I started buying yarn because I liked the colors, or the texture, or because it was lace or DK weight. Often times, it was a combination of several factors that led to a yarn purchase. I wasn’t worried that I didn’t have a pattern in mind when I was buying yarn to add to my quickly growing stash. I knew that I had magazines and books and (soon) Ravelry to go to for inspiration, but I also had a couple stitch dictionaries which led to true designer moments. And that, my friends, leads me to now. In June of 2013, I finished a design journey that started in January with a quick question and ended with selling four designs to a well-known yarn company. What a journey of development I have been on since 2009, and it all started with the choice of picking a different yarn than what is called for in the pattern. 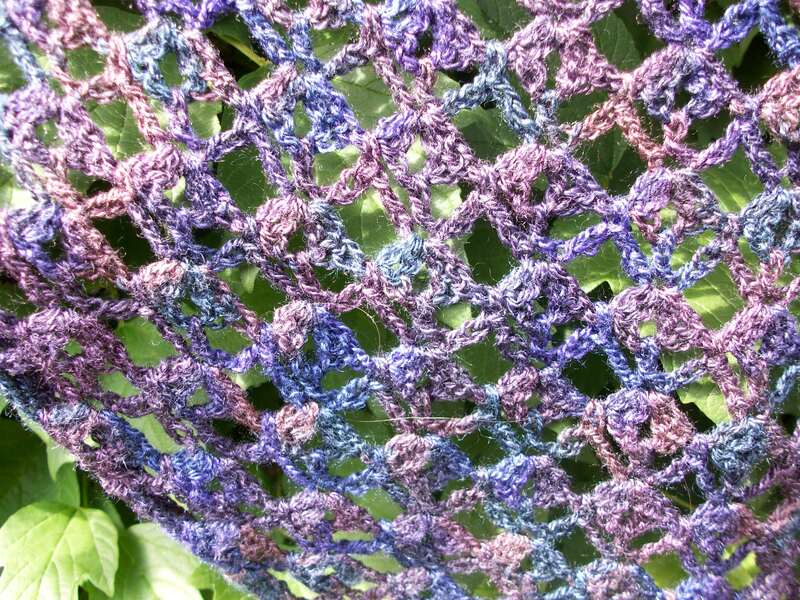 So for me, the pattern came first when I was just crocheting, but now as I branch out into design, it’s the yarn that comes first, and the pattern is designed to compliment the yarn. Whew! Now I got all of that out of my system, I want to know about you. Do you strictly follow patterns, or do you pair yarns you like with a pattern to follow and go from there? Or do you let the yarn whisper to you and it tells you what it wants to be? I want to hear all about it! To entice you to comment, I have a lovely little give-a-way, open to ALL! Yes, that includes any international readers I may have. 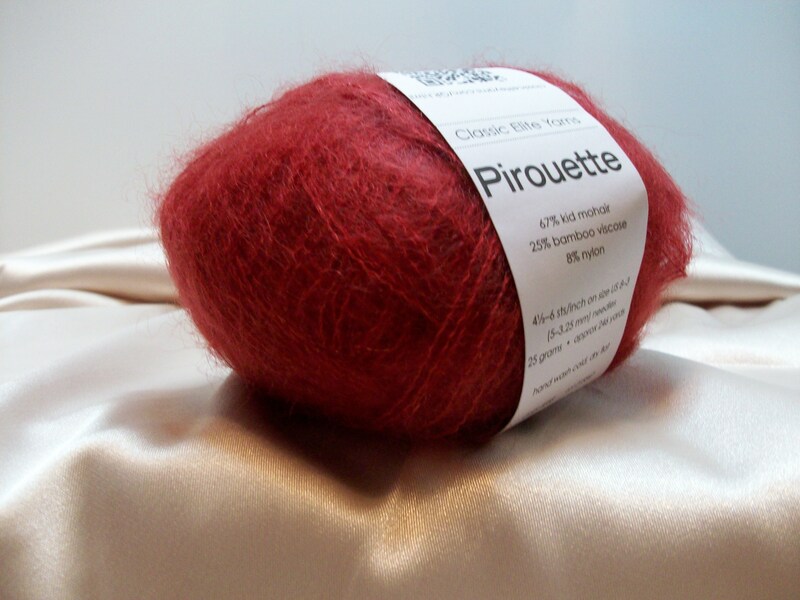 I’m giving away a ball of Pirouette by Classic Elite Yarns, as shown below. Please post a comment, including your name and city and/or country, by midnight CST on July 28, 2013, and a winner will be chosen by random number generator by July 30th. Good luck to all, and thank you for reading. Laura – what a fabulous blog!